With a price tag of a 160cc motorcycle, can the Xtreme 200R shake up the 200cc segment? The Hero Xtreme 200R has been late to the 200cc party. Bikes like the TVS Apache RTR 200 and Bajaj Pulsar NS200 have been here for a long time and offer good performance. On paper, the Xtreme 200R feels bland. But then it has a USP. A sticker price below Rs 90,000 means you can have a 200cc bike for 160cc bike money and that seems like shockingly good value. Who then does the Xtreme 200R have its eyes trained on? A proper road test with performance and fuel efficiency numbers should sort out this conundrum. Hero sells just one variant of the Xtreme 200R and that's what we are reviewing today. Seems familiar, doesn't it? That's because the Xtreme 200R carries forward the smaller 150cc Xtreme Sports’ design language, albeit with more aggressive and muscular lines. It feels like an overgrown Xtreme Sports thanks to a large headlamp, large fuel tank and tank extensions, a large tail section and even a large blacked out exhaust. It is a recognisable face and should appeal to those who loved the Xtreme Sports’ exaggerated lines. The graphics, though loud look appealing. It gets five colour options: Heavy Grey/Orange, Black/Sports Red, Sports Red, Panther Black/Force Silver, and Techno Blue. Fit and finish is a bit disappointing with glaring panel gaps on the fuel tank and inconsistent welds on the steering head and rear brake pedal. Of the competition, the Xtreme 200R has the shortest seat height of 795mm. That and the narrowness of the seat should allow even 5ft 6in riders to be seated with both feet flat on the ground. That said, the narrow seat has a rounded profile that is highest along the centerline and tapers towards the side, like a horse’s back. This puts a lot of strain on your crotch area and can be supremely uncomfortable over longer journeys. The riding position is a mix of sporty and commuter, forcing you to bend forward slightly to reach the handlebar. The footpegs are slightly rearset and overall, the bike is comfortable for city runabouts. Taller riders should not have a problem on this bike either as there is ample knee room in the scalloped fuel tank recesses. Pillions might complain about the narrow seat but not about its length or the comfortable seating stance, pillion grab rails and easy to reach pillion footpegs. Switchgear quality is at par with the competition but the ungainly looking round choke knob looks like an afterthought. The headlamp carries a halogen bulb setup with two pilot lamps while the turn indicators carry a bulb type setup as well. It runs on an old-school AC lighting setup which results in poor headlamp intensity. We like the sharp looking LED tail lamp unit though. On the feature front, you get a semi-digital instrument cluster that looks dated in the face of its competition. It is spartan in its layout with the digital blue backlit console showing just the speed, fuel level, odo, two tripmeters, and a clock. You also get telltale lights mounted atop the console with two extra indicators for the ABS and side stand. And that brings us back to our first question. Now the Xtreme 200R has a very basic engine architecture in the form of an air cooled, two-valve OHC carburetted single-cylinder unit. This motor is no patch to the competition’s liquid cooled motors that put out between 20-23PS. At 18.4PS at 8000rpm and 17.1Nm of torque at 6500rpm, this 199.6cc motor does make more power than the 160cc crowd owing to the extra 40cc. So does the Xtreme 200R match up to the 200cc crowd or is it more in line with the 160cc segment? Let the numbers decide. In our V-Box tests, the Xtreme 200R managed to hit 0-60kmph in 4.98 seconds. That’s 0.45 seconds slower than the carburetted Apache RTR 200 and 0.12 seconds slower than the Pulsar NS200. The gap widens on the 0-100kmph run as the Xtreme’s time of 14.92 seconds is 1.63 seconds slower than the Apache RTR 200 and a whole 2.34 seconds slower than the Bajaj. Despite being low on power and weighing almost as much as the competition, the Xtreme 200R manages to stay close to the others in the run up to 60kmph thanks to its shorter gearing. However, on the run to 100kmph, the gap widens as you have to shift to fifth gear to reach 100kmph. Once in fifth, the motor loses steam post 8000rpm and takes an agonisingly long time to reach 100kmph. It shows in the top speed run as well as the Xtreme recorded a true speed of 110.72kmph as compared to the Apache RTR 200’s 117kmph and Pulsar NS200’s 125kmph top speeds. This motor has a good mid range and feels peppy even at low speeds thanks to its short gearing. In roll-on acceleration, the Xtreme 200R’s numbers are more on par with the 160cc segment. 30-70kmph in third gear takes 6.14 seconds, which is 0.53 seconds slower than the Bajaj Pulsar NS 160 and 0.54 seconds faster than the Honda Hornet 160R. Interestingly, 40-80kmph in fourth gear on the Xtreme 200R takes 7.56 seconds, which is 0.29 seconds slower than the Pulsar NS 160 and 0.67 seconds faster than the Hornet 160. That’s a tad disappointing considering the bikes have similar gearing and that the Xtreme 200R has a higher power output. During acceleration, the motor will pull to its 9200rpm redline but it does feel harsh post 7000rpm. Performance numbers aside, the motor is extremely tractable in the city. This allows it to eke out 40.69kmpl in city riding. Out on the highway, you are riding at 80kmph in fifth gear at a higher 6250rpm. This takes a toll on fuel efficiency as it drops to 36.9kmpl. The shorter gearing and lack of sixth gear mean the Xtreme 200R is not as fuel efficient as either the 160cc or 200cc competition. Overall, the motor does not impress. When compared to the 200cc segment, it loses out not just on performance but also fuel efficiency. Sure, it is faster than bikes from the 160cc segment. But then those bikes offer similar in-gear acceleration figures and even better fuel economy. Interestingly, the Xtreme 200R has a very short first gear ratio, which might feel odd. But when you consider that this motor will also be available in the XPulse 200 adventure bike, albeit with fuel injection and likely a slightly altered state of tune, it starts to make sense. 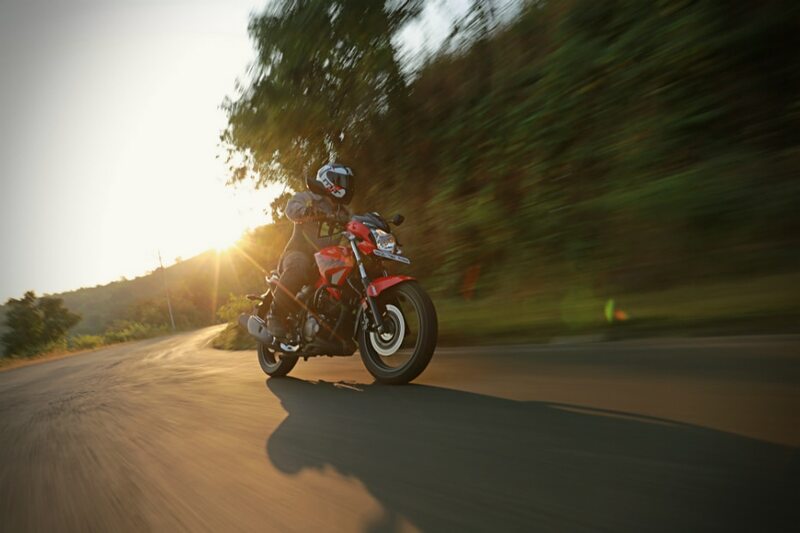 With the Xtreme 200R, Hero aimed to achieve a balance between sporty handling and comfortable ride. Thus, it’s built on a conventional diamond type frame. You also get beefy 37mm front forks and a rear monoshock that is preload adjustable. Now the Xtreme 200R handles well. It felt well balanced when we rode it the first time at the Buddh International Circuit (read our first ride review here). Out in the real world, specifically on the twisties of Lavasa, she does hold her line through fast corners. Turn-in is quick, though not as fast as the competition. The front end does feel a bit skittish closer to the limit and that is down to the tyre setup. It uses a 100/80-17 section bias ply MRF Nylogrip front tyre and a wider 130/70 R17 radial rear tyre. While they work well under normal riding conditions, we would have liked a stickier front rubber at least as an option. Where the Xtreme 200R impresses is in the ride department. The bike feels extremely composed over ruts, potholes and bumps at both low and high speeds. Hero has managed to get the suspension tuning and damping spot on here. Irrespective of the road surface, you have a comfortable ride throughout. Had it not been for the slightly uncomfortable seat, you could spend the whole day riding the Xtreme 200R in comfort. Braking is via a 276mm front disc and a 220mm rear disc with a single channel ABS unit. In our braking tests, the Xtreme 200R came to a standstill from 80kmph in 42.65 metres and from 60-0kmph in 24.39 metres. These are disappointing given the heavier, non-ABS TVS Apache RTR 200 takes 4.62 metres and 3.19 metres less distance in the 80-0kmph and 60-0kmph brake tests, respectively. Despite the less than ideal numbers, the brakes offer good feedback. The ABS does feel a tad bit intrusive but works well on loose surfaces like dirt and gravel. So who exactly is the Xtreme 200R for? Well, it’s a very difficult peg for sure. For those looking for a 160cc motorcycle, the Xtreme 200R can feel like a worthy upgrade since it’s providing improved performance without a bump up in price. The downside to that, of course, is that you won’t be getting as much fuel efficiency as a 160. For those in the market for a 200cc motorcycle, this Xtreme can certainly seem tempting thanks to its budget-friendly pricing. But that’s at the cost of performance, as well as premium feel and features. Considering its these factors that draw most people to the 200cc segment, the Xtreme is hard to recommend here too. The problem with the Xtreme 200R is that it feels like a compromise, not an adjective you’d like to hear for a bike that aims for the premium 200cc or even 160cc segment. So then you really have to stop looking at the Xtreme 200R as a premium product, at least in the conventional sense. Instead, look at it as a comfortable commuter-friendly 200cc bike that gives you great ride quality and has all the performance you’d expect from a city bike. It even has more in reserve if you should need it. Heavier commuters, those who would always want to travel with a pillion, or those whose commutes involve steep terrain, would really appreciate the extra lugging power of the Xtreme 200R. And it does help that it’s decently fun to ride too. But anyone else might want to look elsewhere.